I wrote this post in January 2011, during out last trip to Germany. I never published it because it didn’t feel quite right. After 18 months of off-and-on tweaking, I’m mostly happy with what it says. Mostly. The trains pass often. I listened to them in the dark for the first couple nights as I laid awake in bed, unable to sleep. The jetlag was worse this time. Burrowed deep under thick blankets with just my nose above in the chill, I listened to the village. I listened for the clack-clackity-clack of the freight trains as they flew past, not stopping at our little station on the Rhine. Contrasted with the stealthy, almost inaudible whoosh of the new Regional Bahn trains, taking people in and out of the city. So quiet, you can’t hear them during the day, only at night. I listened for the rumble of delivery trucks on cobblestone streets early in the morning, before the sun rose. Before the village fully woke. The tapping of Uncle E’s shoes on the stairs as he left for work in Frankfurt. Our vacations to Germany are different that most of our trips. We go to visit H’s family, not to see the sights – although we always end up visiting something new. A new house, a new coffeeshop, a new niece. Life is slow, relaxed. What a vacation should be. We play card games, take walks in the village, and eat tons of Oma’s cooking. Normally, I love spending my vacations zooming about at the speed of sound. But sometimes, its nice to take it slow. To eat your breakfast as you watch the mist rise off the Rhine. To enjoy a cup of tea and a slice of cake in the afternoon. To sit down to dinner with the family every night and drink a bottle or three of wine. Each. Wine made from the grapes that Opa planted, many years ago. Some say its not travel when you’re visiting family. 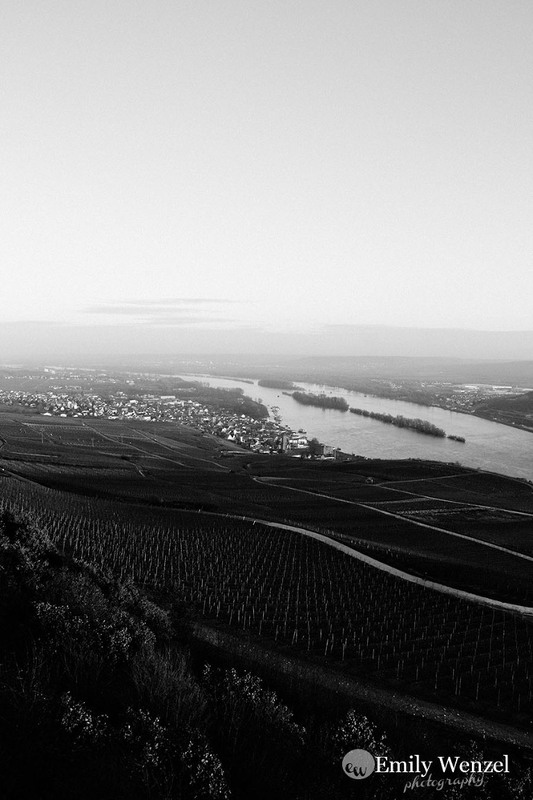 For us, visiting the Rhineland is like finding a favorite sweater in the back of your closet. Almost forgotten — practically new. But it’s still familiar. Comfortable. Remembered. There are still many things yet to see in that village on the Rhine: old churches, new homes, favorite restaurants, tucked-in-a-corner coffeeshops. But there’s no rush. And on those mornings, as I burrow in the covers and hear life stir upstairs, another train goes by. Clack-clickity-clack. And it’s comforting to know that this strange land where I almost speak the language feels as much like home as my own. It’s not a string of destinations on a map. No sightseeing necessary. It’s family, thousands of miles from home. A disclaimer. This is not the view from Oma’s house. It’s the view from a monument in nearby Rudesheim. But it’s similar.